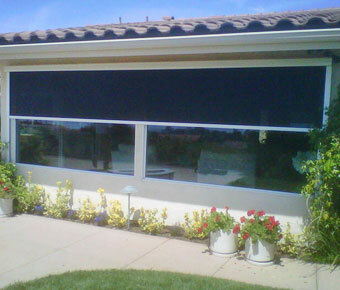 At SunMaster Products, we pride ourselves on providing innovative sun shade solutions for any residential or commercial space, and our attractive sun screens, solar screens, and blackout shades are the ideal solution for providing your San Diego County home, business, or industrial facility with optimal protection from the sun's glare and heat, as well as its damaging UV rays. At SunMaster, we offer the finest solar screens available, in both interior and exterior designs. We install major brand name lines such as Twitchell Textiline, Phifer Suntex, and Sheerweave solar screens, and offer our exceptional quality sun screens with a 10 year warranty. Our open weave fabric, interior-mounted solar screens are very effective at blocking the sun's glare and harmful UV rays, and protecting home and business interiors from fading while maintaining a scenic view. And our very durable, open-weave fabric exterior mounted solar screens are extremely effective at blocking unwanted heat, preventing up to 97% of the sun's heat from penetrating through the surfaces of your home or commercial building's windows and glass doors, while still preserving your view. In addition, when both sun protection as well as complete light blockage is desired, we can install our attractive blackout shades, providing total room darkening for our valued clients. At SunMaster, we offer both our interior and exterior solar screens in a wide selection of fabric colors and densities, and a choice of manually operated and motor operated systems. Call the solar screen specialists at SunMaster Products today. We provide free onsite consultations and estimates to all of San Diego County and the surrounding areas, and accept Visa, Mastercard, Discover Card, and American Express. Our office hours are Monday through Friday, from 8:30 am to 4:00 pm. SunMaster Products, Inc. holds California State Contractor's License #288419, and is bonded and insured. Exterior or interior mounted designs. Choice of fabric color and density: open weave PVC coated polyester/fiberglass mesh. Top name brands: Twitchell, Textiline, Phifer Suntex, and Sheerweave. Maintain views while blocking glare. Block harmful UV rays; protect furniture from fading. Exterior mounted solar screens provide up to 97% heat blockage. Available in manual or motorized designs. Provide the ideal motorized screening system for window walls. Block out all daylight for maximum room darkening. Offered in a durable vinyl coated polyester which provides 100% UV blockage. Choice of fabric colors, patterns, and weights.